Congratulations on starting The Green Smoothie Challenge! Now what? Questions about what blender to use, taste tests that scored a “Meh,” food allergies to the best tasting foods, and possible physical limitations can all make your motivation take a nose dive. All hope is not lost! 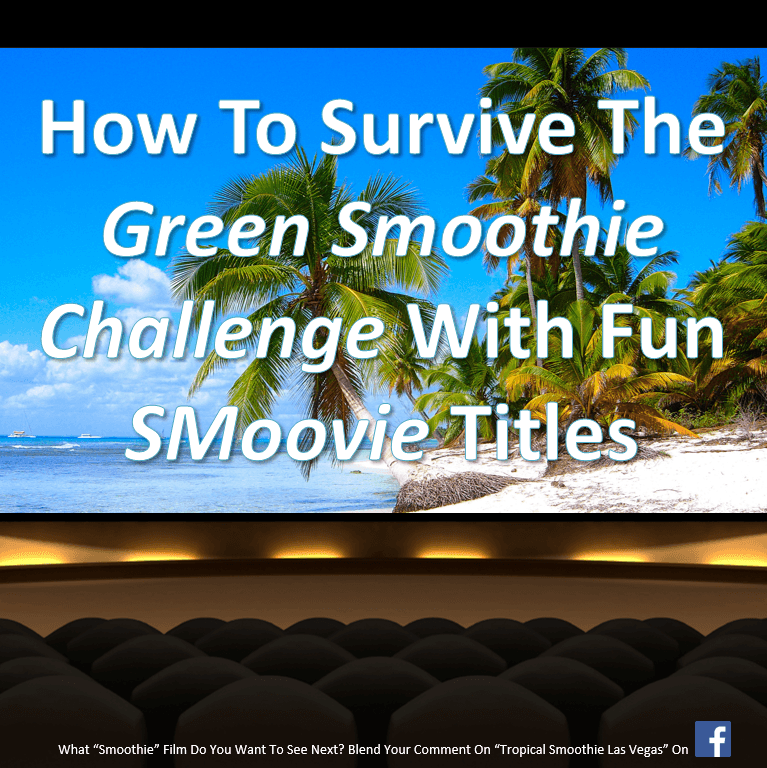 I’ll show you How To Survive The Green Smoothie Challenge With Fun “SMoovie” Titles! I really want to help motivate and inspire you. I’ve researched some of the most common questions and concerns on The BEST Green Smoothie Challenge facebook group EVER and want to serve you in a fun and encouraging way in the form of Super-Dee-Duper SMoovie titles! Green wha? To be honest, I didn’t even know what a green smoothie was before November 2013. I usually just put chocolate protein whey, yogurt, and milk in $30 blender and pressed a button. Bzzzz it went. I moved to Las Vegas for work in November 2013 and was looking to meet some people who were interested in eating healthier. I weighed 185 lbs (wanted to lose about 30 lbs), had blah-zay energy levels (wanted to have more consistent energy), and had digestion issues (was looking to feel better). Out of more desperation, I did what many people do…I started searching online for the answers! I came across a Raw Foods meetup group in Las Vegas and attended a few events and really enjoyed my experience. I later learned about Robyn Openshaw’s Green Smoothie Lecture Tour and was excited that she was coming to Vegas! I could learn how to improve my health AND attend a class for FREE (or pay about $15 and get a Green Smoothie Diet book for the price of admission). When Dr. Green Smoothie disappears out of nowhere while pursuing the Holy Grail of “Challenges,” world renowned smoothie-ologist Blendindiana Jones must find out how to save his father AND stop the Standard American Diet from it’s SAD grasp on his daddy-doc. This Smoovie is rated PG-13. Not suitable for people who want to let processed foods take over their health goals. Coming to a SMoovie theater near you. The question of what type of blender came up so let’s tackle it like a pineapple shall we? Pros: The square container is easy to clean, not as tall as vitamix so can fit under the kitchen counter (or travel with you), and the blade has a lifetime warranty. What’s best of all is that the Blendtec has a 3 horsepower motor which blends fruits and veggies to water-like consistency making green smoothies easier to drink, digest, and absorb the nutrients. Cons: It does not hold as much fruits and veggies as the Vitamix and can overflow if it’s filled above 36 ounces (this has happened to me numerous times, probably because I eat too much). The price is in the mid-300’s to early 400’s depending on the deal you get, which is about the same as the comparable Vitamix model . Pros: It holds 96 total ounces and is taller than the Blendtec. This allows you to blend more fruit and veggies at a time without as much risk of it “overflowing.” Vitamix has a better overall warranty and customer service than Blendtec. Cons: Vitamix only has a 2.5 horsepower motor and the price is about the same as the similar Blendtec model , which is NOT “cheap” by any means. You pay for the quality and this blender is for SERIOUS green smoothie drinkers and raw foodist. From cheapest to most expensive; I’ve used the NutriBullet , NutriBullet Pro , Ninja Plus , Blendtec , and Vitamix . They all have pros and cons, but my personal favorite is still the Blendtec. It has easy to use buttons, blends fruits and veggies to water-like consistency, and has a great warranty. If a Blendtec breaks down due to wear and tear, they will send you a new one in exchange for your old one and they will pay for all the shipping (as long as it’s within the 7 year warranty). This has already happened to me once and it was a pretty painless process (although I did have to wait over 30 mins and make a few calls to get the issue resolved). A high speed blender like the Blendtec is an investment, but it’s an investment in your health, which does NOT have a price tag. Which blender should Blendiana Jones choose to save his father? Wholly Blender! What Now Tropical Smoothie Guy? What “SMoovie” title do you want blended up next? Leave a comment or question on the OFFICIAL facebook group TODAY. Super Green Smoothie reappears after a long time off, but is “Challenged” by an old nemesis who uses “Blendonian Technology” for tropical smoothie supremacy. Super Green Smoothie must find out how to go from green to lean in one month’s time. This SMoovie is rated PG-13 due to some scenes that contain mild violence. Many green leafy vegetables and fruits get blended to a pulp. No enzymes used for better digestion are harmed in the making of this film. See your local listings for SMoovie showtimes. The question of which recipe actually tastes good and can fight colds was asked and it’s important that green smoothies are healthy AND Delicious. If our stomach (and immune system) likes the green smoothie but our taste buds thinks it’s crap-ol-la then it’s going to be hard to turn this little challenge into a habit and ultimately a lifestyle. The goal should 1/3 Water + 1/3 Greens + 1/3 Fruit. Use more fruit for sweetness and use more greens for fiber and protein. Choose 1-2 items from each shelf in the infographic I created just for you! Try to make it your own since it’s important that YOU like it. Can You Just Gimme a Beginner’s Green Smoothie Recipe Pwease? No prob. I got you. Step 3: Store any leftovers in a glass or stainless steel container in the fridge. Stays fresh for about 48 hours. What should Super Green Smoothie choose to overcome the Blendonian technology? Sweet Mother Of Blendonia! What Do I Do With All Of This? Got a better “SMoovie” title idea? Leave your feedback and suggestions on the facebook page “Tropical Smoothie Las Vegas.” Make Spielberg proud. When allergies threaten to make fun of and destroy the Smoothie Challenge, participants turn to a non-televised community on facebook for support. The participants are met with foods they can’t eat, internal inflammation, cleansing reactions, and must convince THE BODY to let them have their smoothie and drink it too. This is a matter of life…and…SMOOTHIE! The participants must race against time to save the Capitol of Greens before the month is over. This SMoovie is rated-R and is only for Mature audiences due to the nature of thangs. No discounts or coupons may be used for this SMoovie at this time. The question of allergies to certain ingredients was brought up and it’s critical we address this since people’s smoothies depend on it! Answer: Have you tried organic and fresh apples, mangos, blackberries, blueberries, raspberries, a lemon, or a lime? These are great alternatives and many contain a good amount of fiber (especially blackberries) per serving. Answer: Have you tried organic romaine lettuce, red/green leaf lettuce, butterhead lettuce, spring greens, or carrots? Some of these veggies are not as nutrient dense as the darker leafy greens, but they are another option. Question: What if I am taking a blood thinner medication and either can’t eat greens or have to limit the amount of greens I eat due to the Vitamin K content? Answer: The best thing to do is consult with your doctor and get a second opinion from another trained professional. This is a very serious matter and I want you to make the most educated decision possible. Learn more about this topic by reading Robyn Openshaw’s blog post on Denise Gets Off Coumadin. Answer: Have you tried raw and organic ground flax seed, pea, or hemp? Flax is good source of fiber and is high in omega-3’s which can help with reducing internal inflammation and pain. Pea and hemp are easily digested and are good sources of protein and fiber. Okay, Now I’m FULL! What Are My Next Steps? 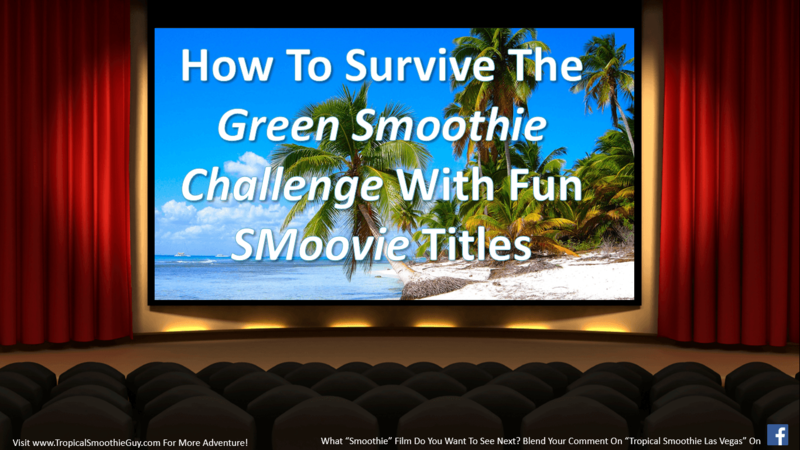 Got a “SMoovie” title that would top Avatar or Shawshank Redemption? Join the OFFICIAL Facebook page “Tropical Smoothie Guy” to learn about other blog posts and updates. This season your Green Smoothie will NEVER be the same. Before there was facebook, before there was Youtube, and before there was even GOOGLE (okay, well maybe not that far back), but definitely before there were 10 foot Smurfs running around the computerized version of the FernGully jungle on the big screen…There Was A SmAvatar…Rise Of Blendora (Dun-Dun-Dun)! This prequel to first SMoovie in 2009 shows how before those oversized blue feline-lookin’ thangs with hybrid people faces were “blue”…They were actually GREEN! They once lived off the planet of Blendoria and enjoyed Green Smoothies in abundance but a NEW Threat arrived that would change the course of their history…and skin complexion. The Standard American Diet (SAD as it is) of processed foods, soda, and sugars totally JACKED their skin up and caused levels of toxicity that made them so sad that their skin turned BLUE! This SMoovie is rated “G” for Green Smoothie Audiences (and for perfect ratio of nutritious dark leafy greens to sweet fruits). Disclaimer: Please talk with your doctor to see if Green Smoothies are right for you. Movie Announcer Guy is not responsible for your results in the Green Smoothie Challenge if the previous suggestions aren’t followed. I don’t pretend to be a doctor…I just play one on SMoo-V. There are a ton of different blenders to choose from, a lot of recipes to pick, and an unlimited number of reasons to quit a smoothie challenge. This is why having an accountability partner and reaching out whenever you need help is the key to making your smoothie WORK FOR YOU (and not the other way around). What Are My “For Real” Final Steps? The first thing you can do is remember these 4 magical words…YOU CAN DO IT! Don’t give up and know that you are not alone. You have a community of people waiting to grab a seat next to you and enjoy the SMoovie of your life! Check out my other post on making your own Tropical Smoothie Menu. What used to work for locations with regards to just specializing in tropical smoothies and providing quality, maaay not be the case now. Search on Instagram for the “Tropical Smoothie Guy” on your smart phone or tablet for more inspiration!